Please do not edit this page. This is a student assignment for the BSc(Hons)Physiotherapy programme at Queen Margaret University. We are a group of 4th year BSc (Hons) Physiotherapy students at Queen Margaret University, Edinburgh. As part of our Contemporary and Emerging Issues in Physiotherapy Practice module, we have decided to complete an online learning resource. This resource is primarily aimed at senior physiotherapy students and newly qualified physiotherapists. This online wiki will explore the areas of communication and health literacy when working with patients who have learning disabilities. This resource will take approximately 10 hours to complete and will contribute to your CPD profile. Besides providing you with new information and researched evidence, there will be quizzes and opportunities for you to reflect. 1.To provide final year physiotherapy students and new graduates with an online learning resource which develops their knowledge of learning disabilities and the common associated conditions that may require physiotherapy interventions. 2.To introduce final year physiotherapy students and newly qualified graduates to the skills and strategies which can be utilised within their practice to offer a more effective and comprehensive management of communication and health literacy to those with learning disabilities. 1.Discuss the impact of learning disabilities on the person and their needs in relation to physiotherapy interventions. 2.Critically appraise the evidence base and some of the key approaches surrounding communication and health literacy within learning disabilities. 3.Summarise the characteristics of psychological impacts and the underlying neurophysiology of communication difficulties experienced by those with learning disabilities. 4.Critically reflect upon the possible challenges faced by physiotherapists when communicating with people who have learning disabilities. 5.Critically evaluate the role of the physiotherapist in the area of learning disabilities with reference to relevant literature. 6.Formulate stronger patient-therapist relationship by applying these effective communication methods in the practice setting. Different individuals have different learning styles, thus as part of our consideration for you to make the most of your learning through this wiki, various activities and resources will be included to cover the different learning types and styles. Are you aware of the different learning styles and which best suits you? 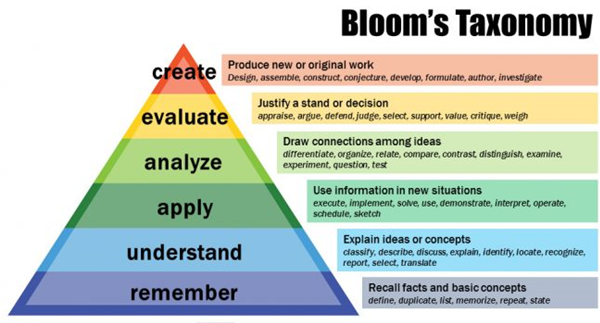 Bloom's Taxonomy uses a hierarchy to establish the different learning levels. Figure 1 demonstrates the pyramid structure and highlights that a foundation needs to be part of the learning process before this learning can be applied to everyday practices, and evaluations can be made. Learning outcomes for this wiki have been based around Bloom's model, and the higher learning levels have been selected to be appropriate for final year students and newly qualified physiotherapists. This is to allow a deeper understanding of the topics covered and to be able to apply these to everyday situations. •There is a gap in the literature. •There is no current module in the BSc/MSc pre-reg courses on learning disabilities. •Literacy and communication difficulties are experienced by many people with learning disabilities. 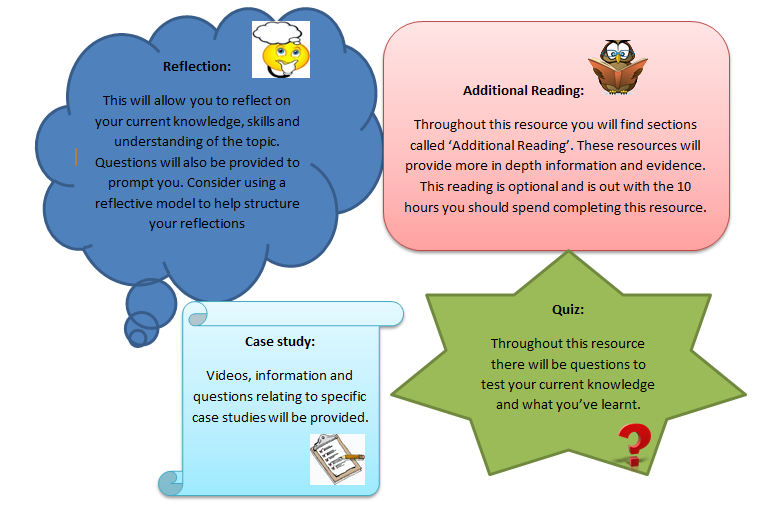 There will be different activities provided throughout this resource which are aimed at the different learning types. Improves the effectiveness of communication through communication skills. Constructively manages barriers to effective communication. Takes responsibility for own personal development and takes an active part in learning opportunities. Evaluates the effectiveness of learning opportunities and alerts others to benefits and problems. Acts consistently with legislation, policies, procedures and other quality approaches and encourages others to do so. Uses and maintains resources efficiently and effectively and encourages others to do so. Recognises people’s rights and acts in accordance with legislation, policies and procedures. Monitors individuals during assessments and takes the appropriate action in relation to any significant changes or possible risks. Evaluates assessment findings/results and takes appropriate action when there are issues. 1) How many people in the UK have a learning disability? 2) What are the main causes of a learning disability? 1)How many patients treated on your placement or in your career had a learning disability? 2)How confident do you feel treating a patient who has a learning disability? The World Health Organisation (WHO) in 1992 defined a learning disability as ‘‘a condition of arrested or incomplete development of the mind, which is especially characterized by impairment of skills manifested during the developmental period, which contribute to the overall level of intelligence, i.e., cognitive, language, motor, and social abilities’’. However, this definition is outdated and implied the term ‘mental retardation’ which is deemed very offensive by many people today. The terms used to describe a person with a learning disability has been changing since the 1970s, from people with mental sub-normality to mental handicap to eventually learning disability in the 1990s. In other countries such as the United States (US), the terms ‘intellectual disability’ and ‘mental retardation’ are used instead. Do note that in the US, the term learning disability is used to describe specific learning difficulties such as dyslexia, dyspraxia and dyscalculia. 2.Social or adaptive dysfunction combined with IQ; and http://www.physio-pedia.com/extensions/FCKeditor/fckeditor/editor/images/spacer.gif 3.Early onset. As mentioned earlier, different terminologies are used in different countries. It is important not to confuse learning disability with learning difficulty. In the UK, specific learning difficulties refers to conditions such as dyslexia, dyspraxia/developmental coordination disorder, dyscalculia and attention deficit hyperactivity disorder (ADHD). Specific learning difficulties affect the way information is learned and processed. It is a neurological condition rather than a psychological condition and it does not affect intelligence. A student may be diagnosed with a learning difficulty if there is a big gap between achievement and ability or there is lack of achievement for age and ability. Dyslexia is a difficulty that affects 10% of the population. Dyslexia affects the way a person processes information, they may have difficulty with memory, organisation and sequencing. Dyspraxia is a disorder that affects fine and gross motor skills in children and adults. Dyscalculia is a difficulty understanding maths concepts and symbols. Finally, ADHD is a disorder that affects attention. A person with ADHD may be restless, inattentive, impulsive, erratic and have inappropriate, unpredictable behaviour. They may appear unintentionally aggressive. Europe: In the European Union (15 countries) 1.1 to 1.5 million people have a severe learning disability and 2.3 to 2.7 million people have a mild learning disability. The term ‘learning disability’ is a very broad description for this group of individuals, with the threshold set at an Intelligence Quotient (IQ) of below 70 in the United Kingdom (UK). As such, terms such as profound, severe, moderate and mild are used in the UK to describe the different severity and levels of need which these individuals may have. Profound: Individuals with an IQ score under 20, with severely limited understanding. They have difficulty communicating, require support with mobility and may need support with their behaviour. They may have multiple disabilities such as visual impairments, hearing impairments and difficulty with movement. They may also have extensive health needs, epilepsy and autism. Severe: Individuals with an IQ score of 20-35. They often use basic words and gestures to communicate their needs. They may need a high level of support with activities of daily living. Some may have additional medical needs and require more support with mobility. Moderate: Individuals with an IQ score of 35-50. They are able to communicate their day-to-day needs and wishes. They may need some assistance and guidance with their personal care and may require longer time to learn new skills. 'Chromosomal conditions': Chromosomes make up the genetic blueprint for humans. Everyone has 46 chromosomes in their cells. Abnormality in their chromosomes can result in a learning disability. Such conditions include Down’s Syndrome, Fragile-X syndrome, Williams Syndrome, Wolf-Hirschhorn syndrome and Prader-Willi Syndrome. Maternal factors: Infections such as Cytomegalovirus and Toxoplasmosis, factors such as diet deficiencies and excessive alcohol consumption during pregnancy can cause learning disability in the unborn child. Metabolic disorders: A person’s metabolism controls all the chemical reactions in the body. Certain conditions affecting metabolism can result in a learning disability. For example, Phenylketonuria is a disorder that increases the levels of a substance called Phenylalanine in the blood. Phenylalanine is an amino acid which is normally obtained through the diet. If untreated the abnormally high levels of phenylalanine can cause severe learning disabilities. Events during birth: A learning disability can occur if a baby’s oxygen supply is disrupted during labour, if a child is born extremely premature or becomes very ill after birth. Events after birth: Some childhood infections such as encephalitis and meningitis can cause learning disabilities. A severe head injury can also cause a learning disability., which will be explored in later parts of the wiki. For the purpose of this learning resource we are going to explore three condtions that are commonly associated with learning disabilties. The three conditions that will be described are Ddown's syndrome, autism and cerebral palsy. Down’s Syndrome occurs when there are three copies of chromosome 21 in the cells of the body. This is also known as trisomy 21. Having three copies of chromosome 21 disrupts the normal course of development and causes the characteristics of Down’s Syndrome and the associated health risks. Strong associations have been found between maternal socioeconomic status, maternal age and chromosome 21-nondisjunction, the cause of 95% of Down syndrome cases. There are three types of Down Syndrome: Trisomy 21 (95%), Translocation (4%) and Mosaic (1%). It is said that 750 babies are born with Down’s Syndrome each year in the UK. People with Down’s syndrome have distinct facial features such as a flat face, a small broad nose, upward slanting eyes and a large tongue, as well as common physical traits of low muscle tone, small stature and a single deep crease across the center of the palm. People with Down’s Syndrome have a higher risk of developing respiratory conditions, leukemia, heart defects, gastrointestinal obstruction, hearing loss and eye abnormalities. People with Down’s syndrome can have a moderate to severe learning disability and often develop much slower than their peers. They may also face communication difficulties, for example stuttering , which will be explored in later parts of the wiki. People with autism have difficulties with interpreting verbal and non-verbal language, tone of voice and gestures. They have a literal understanding of language. They may find it difficult to understand facial expressions and jokes and sarcasm. Some autistic people may not speak while others may have limited speech. They may use alternate methods of communication such as sign language and symbols. This means that people with autism have difficulty ‘reading’ other people. They may appear insensitive, not seek comfort from other people, prefer time alone when overloaded by other people and appear to behave strangely. It may be hard for people with autism to make friends. People with autism may also have repetitive behaviours and specific routines. As the world is an unpredictable place for autistic people they tend to have a daily routine so they know what they are going to do every day. For example, they may want to travel to school/work the same way every day or eat the same meal for breakfast every day. Some autistic people have a highly-focused interest which starts from an early age. These can change or be lifelong. Some examples include, music computer games, train, movie or books. Finally, some autistic people may be hyper- or hypo-sensitive to sound, taste, touch, smells, lights, colours, pain or temperature. This can cause anxiety or on the other hand they may be fascinated by certain lights or colours. This short video illustrates the world from the view of a person with autism. Can you make it to the end? CP is thought to occur in 2 to 3 per 1000 live births. It is an incurable neurological condition that is caused by trauma to the brain or complications that occur before, during or shortly after birth. CP primarily affects mobility and coordination, but may cause intellectual disabilities in severe cases, as well as an inability to speak. Severe cases are usually diagnosed by the age of two, while milder manifestations may not be diagnosed until a child is 5 years old. Most symptoms of CP, such as impairments to cognition, speech and movement, are difficult to recognise until a child is of age to learn how to speak and walk. Other common symptoms include seizures, and impaired bladder and bowel control. Learning disabilities in CP patients can be complicated by the fact that CP symptoms include vision, hearing and communication impairments, which can make it difficult for them to express themselves and for others to know whether the patient comprehends the information. Early intervention before a child turns 3 can help with the learning disabilities associated with the condition. Evidence has shown that 2% of the CP population has learning disability and the number is steadily increasing (Xenitidis K et al 2000). This may be due to higher survival rate in preterm babies, thus CP and learning disability are more highly represented (Aspray TJ et al. 1999). This is supported by Colvin et al. 2004, where evidence showed that babies of 20-32 week gestation have significantly higher risk of both cerebral palsy and learning disability. A systematic review carried out by Odding et al  revealed that 23-44% of the CP population have a cognitive impairment and 30-41% with a severe impairment (IQ<50). 1.Spastic CP: The most prevalent form, accounting for 70-80% of the cases, and are caused by complications in brain-to-nerve-to-muscle communication. These patients are hypertonic and have stiff, jerky movements. They may also develop joint contractures and deformities. 2.Dyskinetic CP: This accounts for 25% of the cases and is caused by damage to the basal ganglia. These patients have slow, involuntary, purposeless movements. 3.Ataxic CP: This accounts for 5-10% of the cases and is caused by damage to the cerebellum. These patients usually have all 4 limbs and trunk affected, and are hypotonic with poor balance and coordination, and intention tremor. 4.Mixed CP: This accounts for 10% of the cases, and is a combination of 2 or more types of CP. These patients usually have stiff and involuntary movements, and low muscle tone, caused by injury to both the pyramidal and extrapyramidal areas of the brain. There is a wide spectrum of orthopaedic problems with learning disability, some as a result of the underlying condition and some others due to accidents. Individuals with learning disability (LD) are exposed to higher risk of injuries more than the general population. It has been shown in Denmark, US and Australia that adults with learning disability are at higher risk of death compared to general public.. These include deaths from accidents, falls, burns, drug toxicity and choking.. Finlayson et al (2014) carried out a study to investigate injuries in 511 adults affected by LD in the UK for 12 months and the result showed that they were twice likely to get injured more than others; with falls found to be the most common reason of injury (accounting 55% of all injuries).. In addition, people affected by learning disability are slower in learning certain skills than others and therefore need more assistance in several aspects of their lives. This is influenced by the severity of the disability which varies from mild to profound (FB foundation website). Affective (mood) disorders: depressive episodes, recurrent depressive disorder, cyclothymia, manic episodes, bipolar affective disorders and persistent mood disorder. Anxiety, stress related disorders: phobic anxiety disorder, panic disorder, obsessive-compulsive disorder, reaction to severe stress and adjustment disorders. Stress related disorders: The people affected with learning disability are more vulnerable to physical, sexual and emotional abuse, therefore more likely to complain of stress-related disorders. Personality disorders: The prevalence of diagnosed personality disorders in learning disability individuals has varied from 22% to 92%, showing that majority of the learning disability population are presenting with personality disorders such as paranoia, schizoid, antisocial, anxious and dependent personality disorders. Dementia: The prevalence of people with Down Syndrome is in the same level as the general population over the age of 65 but in Down Syndrome, dementia appears in earlier age. This explains the impact of learning disability on occurrence of dementia. Coronary heart disease is a leading cause of death in people with learning disabilities (14-20%). Respiratory disease is much higher in people with learning disabilities and is thought to be leading cause of death (46%-52%). The prevalence of dementia is much higher in people with learning disabilities compared to the general population. Epilepsy is thought to be 20 times higher in people with learning disabilities. Uncontrolled epilepsy can have a negative effect on a person’s quality of life and mortality. Sensory impairments: people with learning disabilities are 8-200 times more likely to have a vision impairment and 40% are reported to have a hearing impairment compared to the general population. Physical impairments: Adults who are non-mobile have an increased mortality rate than if they were mobile. A study in the Netherlands reported that people with learning disabilities are 14 times more likely to have a musculoskeletal condition. People with learning disabilities are also at an increased risk of oral health problems, dysphagia, diabetes, gastro-oesophageal reflux disease, osteoporosis, constipation and endocrine disorders. People with learning disabilities have poorer health than people without disabilities, and to an extent, this is avoidable. People with learning disabilities face inequalities from early life, and this includes barriers in accessing timely, appropriate and effective health care. Failure by healthcare professional to make adjustments for people with regard to literacy and communication difficulties. ‘Diagnostic overshadowing’ – where symptoms of physical ill health are mistaken or attributed to a person’s behavioural problem. Negative attitude of healthcare staff towards people with learning disabilities. As mentioned earlier, 50 to 90% of the people with learning difficulties have communication difficulties. According to Chadwick and Jolliffe, communication is defined as “a mutual interactive process involving adaptation by both the communicative partners”. It is not just a pure transaction of information, but also relationships can be formed and build up in the process. Language is a complex form of communication that involves written or spoken words to convey ideas and symbolise objects. Reading, writing, drawing, speaking, listening, adjusting one’s tone of voice, making eye contact are all involved on communication. Communication involves ‘expression’ and ‘comprehension’ with each aspect being related to a specific neural network. The language centres are located in the left hemisphere in approximately 95% of human beings. Broca’s area and Wernicke’s area are located in the left hemisphere of the brain. Broca’s area is known as the motor-speech area and it is located adjacent to the precentral gyrus of the motor cortex in the frontal lobes. This area controls the movements required for articulation, facial expression and phonation. Wernicke’s area includes the auditory comprehension centre. It lies in the posterior superior temporal lobe near the auditory cortex. It plays a role in understanding both spoken and written messages as well as being able to formulate coherent speech. Commands generated in Wernicke’s area are transferred via a fibre tract called the arcuate fasciculus to Broca’s area. Wernicke’s area receives input from both the visual cortex and the auditory cortex. Damage to the language centres of the brain can result in aphasia. Aphasia can affect expression and comprehension of speech, reading and writing, gesture and the use of language. There are 3 types of aphasia - expressive, receptive and global. 1.Expressive aphasia is when a person has difficulty translating their ideas into meaningful sounds which results in non-fluent speech. It is associated with damage in Broca’s area. 2.Receptive aphasia is associated with damage in Wernicke’s area. People with receptive aphasia have difficulty in the comprehension of language. 3.Global aphasia occurs where there is widespread brain damage including lesions in the left hemisphere. This results in impairment of both expressive and receptive language functions. There are also a range of other neurological signs such as hemianopia, hemiplegia, visual impairments, auditory impairments, attention and memory impairments and other cognitive impairments. Dysarthria refers to difficulty with executing speech. There are five sub-systems that are required in the coordination of speech. These include respiration, phonation, articulation, resonance and prosody. Weakness in any of these systems or incoordination of these systems can cause dysarthria. This is an inability to programme speech movements. It is an impairment in the ability to coordinate the timing, force production and sequencing of movements for the production of speech. A person may not understand some or all of the instructions that are given to them. A person’s non-verbal communication may suggest that they understand what you are saying but in fact they may not understand what you are saying. A person may mirror you, such that if you smile and nod they may do the same and they may also mirror your body language too. Some people may have difficulty finding their words which will affect the way they answer your questions. Difficulty in communication can lower one’s self-esteem and result in low moods which will further impair communication. This may result in “diagnostic overshadowing”, where people with learning disabilities are often misunderstood as having challenging behaviour when it is in fact their way of trying to communicate, and hence they are less likely to have chances to express their views. When speaking to people with learning disabilities, easy and simplified language should be used at a slow comfortable pace to promote positive interactions, but it should not appear supercilious. Common subtle indicators of pain you can watch out for include changes in behaviour, noise level, body language or facial expressions and holding the part of the body that hurts. In 2009, Kingston and Bailey recommended tools such as the “pain diary” (Figure 1), which is “a tick chart designed for the person with a learning disability to complete”, as well as the “pain story” (Figure 2), which is “a templated designed to help individuals talk about their pain” and “included aspects of a person’s history, their previous experiences of pain, and the current influences upon their behaviour”. These simple tools with pictures and symbols have been found to enhance communication and assessment, as they not only “help with identifying the location, type, severity and duration of pain” ., but also allowed people with learning disabilities the opportunity and freedom to talk and describe their pain, and it is highly reassuring for them when the health professionals like physiotherapists are able to understand and believe their words. For those with more complex communication difficulties, there are “augmentative and alternative communication strategies (AACs)”  that physiotherapists can use, such as “Makaton, British sign language, braille and the use of assistive technology”.Makaton is a language programme that uses signs and symbols to help people communicate. The signs and symbols are used in spoken word order and help develop the communication skills of the person. is a language programme that uses signs and symbols to help people communicate.. Furthermore, according to the Royal College of Speech and Language Therapists in 2006, “manual signing continues to be used as an intervention strategy” for the people with learning disabilities, thus if physiotherapists are able to pick up simple signing, it will greatly aid in their communication with their clients with learning disabilities. This video highlights key points you should keep in mind when communicating with people with learning disability. It is aimed at General Practitioners, but physiotherapists can use this information too. Inclusive communication aims to ensure that people with communication support needs are able to live independently, access services easily and are able to participate in the wider community. A person with communication support needs may need support with understanding, expressing themselves and interacting with others. As physiotherapists we need to use other methods of communication so that our patients understand what we are saying to them and are able to express themselves. Not turn up for an appointment. Respond only to some advice given or nodding their head as though they understand. Ask lots of repeated questions. Give irrelevant, rambling or unclear sentences. Appear bored or unable to maintain attention. Have difficulty describing feelings or events, may be explained in sentences that do not make sense. Express very strong emotions that may seem inappropriate to the situation such as anger or frustration. It is imperative to always acquire informed consent from the patients before commencing assessments or treatments. Informed consent is defined as: ‘an individual is always presumed to be competent, or to have mental capacity to enter into a particular transaction, until the contrary is proved’ (Law Society – BMA 1995). Therefore, you should bear in mind that no one, even the parents, can consent to or refuse treatment on behalf of another adult who lacks capacity to consent. Some people will never be able to make decisions, but judgement must not be made until all practicable steps have been taken to help the patient. You must only regard a patient as lacking capacity once it is clear that after all appropriate help and support, they cannot understand, retain, use or weigh up the information needed to make that decision, or communicate their wishes. It is agreed during a formal ‘Best Interests’ meeting (a multidisciplinary meeting including all professionals/ carers/family/patient involved in the care of the patient) that a particular intervention was in accordance with best practice, which includes best medical interests and the patient’s general being, wishes, and needs. Never ever coerce a patient into making decisions, just because you believe that the patient should have the treatment. If controversial circumstances are involved, decisions around best interests should be made via the court. What does capacity to give informed consent mean? Capacity refers to the ability to use and understand information to make a particular decision at a particular time, and can vary in the same person for different decisions. Understanding depends on cognitive abilities, effective communication and accessible information. A person with capacity has the right to refuse treatment, whereas in the case of an adult who lacks capacity, the health professional has a duty to provide treatment and care in the best interests of that adult, even if the person does not agree. Where the patient has never been competent, relatives, carers and friends may be best placed to advise on the patient's needs and preferences. It is good practice to consult with people close to the patient to gain agreement unless the person had good reasons that they would not wish those people to be consulted, or the situation is urgent. If an incompetent patient has clearly indicated in the past, while competent, that they would refuse treatment in certain circumstances (an 'advance refusal'), and those circumstances arise, you must abide by that refusal. Health literacy has many definitions released since the first definition introduced by the Council on Scientific Affairs for the American Medical Association (1). The World Health Organization in collaboration with the European Health Literacy Consortium (2) developed and released the following definition: “Health literacy is linked to literacy and entails people’s knowledge, motivation and competences to access, understand, appraise and apply health information in order to make judgements and take decisions in everyday life concerning health care, disease prevention and health promotion to maintain or improve quality of life during the life course”. The European Health Literacy Consortium based their research for the determination of the health literacy terminology on the European Health Literacy Survey. This model was based on the medical and public health views of health literacy and the data were collected through the analysis of 17 peer-reviewed definitions and systematic literature reviews analysis. The United Nations Educational, Scientific and Cultural Organization (UNESCO) (4) estimated that 16% of the adult world population, lack even the basic literacy skills. According to Doyle et al. (5) communicating health information is a core skill required by all healthcare professionals. In order for the information provided to be useful, it is critical that the recipients are able to understand the information they are given. Part of the difficulties with communication that people with learning disabilities may face include an inability to understand speech, writing and symbols. This will make any situation within healthcare difficult but it especially applies when providing information or giving instructions to patients, noted by Chinn (6). Within Scotland, 26.7% of people have occasional difficulties with day-to-day reading and numeracy, and 3.6% will have severe constraints (7). Those with intellectual disabilities face a range of challenges with communication; between 50-90% are estimated to have significant difficulties with communicating (6). This makes communication with healthcare professionals difficult and can affect their ability to make informed decisions. According to the graph more advanced countries like Netherlands have a high percentage of education which affects positively the health literacy numbers compared to other European countries, e.g. Bulgaria, with less educated citizens. The classification of the education of each country is based on the International Standard Classification of Education. Internationally the statistics about health literacy are higher in countries with better quality of life, e.g. Western countries, reaching up to 97% compared to countries with less or no quality of life, where the percentage of health literacy can drop down to 50% or even less, given in diagram below (11). Baker et.al. (12) contacted a research on the connection of health literacy and mortality and they concluded that there is a clear correlation between health literacy and mortality. According to the study, contacted in the United States, the mortality risk is increased 50 - 80% to people with inadequate health literacy (See diagram below). “Improving health literacy is critically important in tackling health inequalities. People with low health literacy have poorer health status and higher rates of hospital admission, are less likely to adhere to prescribed treatments and care plans, experience more drug and treatment errors, and make less use of preventive services” (12). Although our topic focuses on individuals with learning disabilities, as the previously stated statistics show, poor health literacy is not restricted to just the learning disability population so the following information can be useful for others who have difficulty understanding information. Scotland’s 2020 Vision for Health and Social Care focuses on prevention, anticipation and supported self-management. At the heart of this commitment is addressing health literacy to deliver a safe, effective and person-centred healthcare service throughout the NHS, regardless of individuals’ abilities. Decreasing the gap between the demands of modern healthcare and people’s abilities will help to reduce health inequalities, and strengthen the wellbeing of both individuals and communities. Making it Easy policy has been developed with a national group, which has drawn on the expertise of front line practitioners, policy makers, academics and those with years of experience with NHS boards and the third sector; they in turn drew on the direct experience of those who have struggled to engage with health and care services. This policy highlights that our challenge In Scotland is to those providing services to make accessible and to encourage more engaging and effective communication. NHS (13) found out that people with learning disabilities are not able to remember or comprehend more than half of the information that is given to them. It is crucial for enhancing the understanding of such people for improving their safety, quality of communication, effectiveness of information provided, supporting self-management and improving health literacy. According to the Patient Rights Act Scotland (8) it is important for the health care staff to communicate in effective manner with the patient, so that he/she can understood the information provided. Make it easy policy is the National Health Literacy Action Plan for Scotland by the NHS Scotland (14). Although, it has been mainly developed for Scotland, it can be proficiently used by other regions to understand the negative influences of low health literacy in people with learning disabilities (14). The policy clear sets out particular actions that must be undertaken by the health care professional to address the problem of low health literacy in people with learning difficulties (14). This is turn means this is should make it easier for individuals to access services, allowing patients to have better conversations with healthcare professionals, and be in an informed place to be able to take control of their own health and healthcare. Making it Easy policy and the 2020 vision for Scotland both focus on the need to make changes and be aware to offer patient-centred care. One of these changes addresses that as a healthcare professional, communication with patients should involve a wide range of approaches, making information accessible to all and to enable all patients the chance to make informed decisions over their own health and healthcare management. Community-based and participatory approaches seem to show some promise. For example, participatory education principles and theories of empowerment appear to help parents access, understand and use health information for the benefit of their own and their children’s health. In addition, initiatives that empower single parents by enhancing their parenting skills, combined with public health, skills development, and recreation interventions, have been shown to improve health literacy, health status and community participation, and to reduce reliance on social assistance. Increase the access to health information through ICT (information and communication technologies). The information needs to be relevant, timely, user-friendly and of sound quality in order to be effective. Provide information through multi-sectoral collaboration. This aim requires the combination and coordination of many sectors in a “horizontal” and “vertical” plane. On the horizontal plane there has to be meaningful partnerships with the key stakeholders in education and business sector. On the vertical is the coordination of local, regional and country levels in order to promote synergy, avoid duplication and more effective to address the determinants of health literacy. Appropriate ways to measure and report any progress in the health literacy levels. The present methods lack reliability and are more suitable for clinical settings, therefore is essential improved methods to be developed in order to include broader areas of health promotion. Make it easy policy shed light on the ignored issues of low health literacy and its negative influence on the ability on an individual to access health care services, understand and engage in health care services available for him/her. It makes clear that low health literacy is the major contributor in the prevalence of health inequality. It is a major challenge and can be dealt with a collaborative approach by the health care professions, resulting in the improvement of health literacy and effective self-management. Wong and Wong (15) stated that from the psychological perspective proficient learners are able to utilise metacognitive tactics but people who have learning disabilities lack the metacognitive skills to guide their learning process. However, on learning metacognitive skills through tools such as easy to read format, these learners can implement the metacognitive skills to direct their own learning in different situations. The Department of Health (16) has suggested that using Easy Read format is one of the tools for ensuring effective access of people with learning disabilities to health-related information. The major aim of an Easy Read document is to give important information to people with learning disabilities, which they should know. Swanson, Harris and Graham (17) argued that Easy Read formats of documents do not contain all the information present in the original document and this means that people with learning disabilities might miss important information. However, Department of Health (16) argues that although, Easy Read format are not complete translation of the document, they are an excellent source for making people understand information that is essential for self-management, as they only highlight important points. These documents provide all the important information that can be used by people with learning disabilities to make decisions associated with health and social care provisions. Easy read format has simple words and pictures to support people with learning disabilities to remember. For example, the leaflet given below is in Easy Read format and provide information to the people with learning disabilities about strengths and weaknesses of people with dyslexia (16). The leaflet has been made using simple words and pictures to support people who lack metacognitive skills. A study conducted by the Department of Health (16) revealed that Easy Read is an effective tool for giving complex information in an attempt to improve health literacy. However, Harwell and Jackson (18) argued that health professional should not just assume that Easy Read formats are always the most appropriate tool for providing information, as people have different levels of learning disabilities. This tool may always not be the answer for managing communication difficulties. Harwell and Jackson (18) further argued that some people may even need help for reading the Easy Read format and in such situations the health professionals can take support of other tools such as videos, presentations and/or one-to-one discussions. However, Snowman and McCown (19) supports the findings made by the Department of Health (16) and asserted that Easy Read documents are an effective tool for managing flow of information between health professional and service users with learning disabilities. Easy Read format helps health professional to provide key information to people with learning disabilities. It is a vital tool for tackling the problem of low health literacy. In this short film, learning disability volunteers from the project of Getting it Right From the Start are sharing their experiences on easy read documents. Learning disability not only affects the quality of life of people facing difficulties in learning, but it also puts a burden on people around them. Harwell and Jackson (18) states that people who have learning disabilities are highly likely to have poor health outcomes. This also means that they have shorter life expectancies than general population. Their poor health outcomes affect people around them, particularly emotionally, thus creating challenges for the health professionals. It is noted that people with learning disabilities often experience health inequalities, resulting in the unfair distribution of social, environmental and economic burden on not only the person who has the learning disability, but also on other members of the general population. As per NICE (20) health inequalities have created burden on the economy and general population. The cost of treating illnesses arising from health equalities has risen to £5.5 billion per year. This has resulted in negative effects on productivity, resulting in productivity losses of about £33 billion annually, in relation to working-age population. Similarly, taxes are lost and an increase in welfare pay outs has been recorded (20). It is identified by Swanson, Harris and Graham (17) that health inequalities can be prevented by improving opportunities for people with learning disabilities to have access to appropriate support from the health professionals. People with learning disabilities often face problem when communicating and this can put their safety at risk and create challenges for people who communicate with them. According to a report by Black (21) the present strategies of care are unsatisfactory, unequal and likely to be breaking the Disability Discrimination Acts. There is a need of adopting practices that can lessen the burden of illness faced by people with learning disabilities and general population. It is important to recognize the disability in its early stages through effective health screenings, in order to provide effective support to the person and his/her family from the start. There is a need of improving health literacy in people with disabilities and in general population, so that people can understand their role in eliminating health inequality. Similarly, it is required that elimination of health inequalities must be measured to assess the progress made by the health professional in reducing the burden of illness (21). The interventions must be focused to addresses the social determinants of health resulting in health inequalities, for example, the diagram below shows that local economy can be supported by regeneration and business grants. Similarly, other social determinants can also be addresses effectively (See diagram below). ↑ Robin. [place unknown: publisher unknown]. Introduction to VARK; 2017 [cited 2016 Dec 12]. Available from: http://vark-learn.com/introduction-to-vark/. ↑ Special Olympics GB. Eligibility criteria, 2015. Available from: http://specialolympicsgb.org.uk/sites/default/files/2015-Eligibility%20Criteria.pdf (accessed 2 Jan 2017). ↑ BILD. Factsheet: learning disabilities. Birmingham: British Institute of Learning Disabilities; 2011. ↑ Mencap. What does learning disability really mean? [place unknown]: YouTube; 2014 Sep 8 [cited 2017 Jan 13]. Available from: https://www.youtube.com/watch?v=3yvZYyeWE20. ↑ European Intellectual Disability Research Network 2003Published in the United Kingdom. Intellectual disability in Europe. Canterbury: University of Kent, 2003. ↑ Emerson E, Hatton C, Robertson J, Roberts H, Baines S, Evison F, Glover G. People with learning disabilities in England 2011. England: Department of Health; 2011. ↑ " /&gt;fckLRfckLR== Factors resulting in learning disability ==fckLRfckLRAccording to the British Institute for Learning Disabilities, these are key factors which can result in a learning disability: &lt;ref&gt;BILD. Factsheet: learning disabilities. Birmingham: British Institute of Learning Disabilities; 2011. ↑ " /&gt;fckLRfckLR== Common associated conditions ==fckLRfckLRFor the purpose of this online learning resource, Down’s Syndrome, Autism and Cerebral Palsy will be explored. fckLRfckLR&lt;br&gt; &lt;b&gt;Down’s Syndrome:&lt;/b&gt; fckLRfckLR&lt;br&gt; Down’s Syndrome occurs when there are three copies of chromosome 21 in the cells of the body. This is also known as trisomy 21. Having three copies of chromosome 21 disrupts the normal course of development and causes the characteristics of Down’s Syndrome and the associated health risks. Strong associations have been found between maternal socioeconomic status, maternal age and chromosome 21-nondisjunction, the cause of 95% of Down syndrome cases. There are three types of Down Syndrome: Trisomy 21 (95%), Translocation (4%) and Mosaic (1%). It is said that 750 babies are born with Down’s Syndrome each year in the UK. People with Down’s syndrome have distinct facial features such as a flat face, a small broad nose, upward slanting eyes and a large tongue, as well as common physical traits of low muscle tone, small stature and a single deep crease across the center of the palm. People with Down’s Syndrome have a higher risk of developing respiratory conditions, leukemia, heart defects, gastrointestinal obstruction, hearing loss and eye abnormalities. People with Down’s syndrome can have a moderate to severe learning disability and often develop much slower than their peers. They may also face communication difficulties, for example stuttering &lt;ref&gt;Jackson C, Cavenagh P, Clibbens J. Communication and self-esteem in adults with down syndrome. International Journal of Language & Communication Disorders. 2014;49(3):275–87. ↑ Jackson C, Cavenagh P, Clibbens J. Communication and self-esteem in adults with down syndrome. International Journal of Language & Communication Disorders. 2014,49(3):275–87. ↑ TNAC. The National Autistic Society. Autism facts and history. Available from: http://www.autism.org.uk/about/what-is/myths-facts-stats.aspx. (accessed 2 Jan 2017). ↑ Cans C. Surveillance of cerebral palsy in Europe: A collaboration of cerebral palsy surveys and registers. Developmental Medicine & Child Neurology. 2000;42(12):816–24. ↑ Tecklin JS. Pediatric physical therapy. 5th ed. Philadelphia: Lippincott Williams and Wilkins, 2014 . ↑ Odding E, Roebroeck ME, Stam HJ. The epidemiology of cerebral palsy: Incidence, impairments and risk factors. Disability and Rehabilitation. 2006;28(4):183–91. ↑ Finlayson J, Morrison J, Skelton DA, Ballinger C, Mantry D, Jackson A, Cooper S-A. The circumstances and impact of injuries on adults with learning disabilities. The British Journal of Occupational Therapy. 2014;77(8):400–9. ↑ Durvasula S, Beange H, Baker W. Mortality of people with intellectual disability in northern Sydney. Journal of Intellectual and Developmental Disability. 2002;27(4):255–64. ↑ Rennie J. Learning disability: Physical therapy treatment and management. A collaborative Approach edition. 2nd ed. Rennie J, editor. Chichester, England: Wiley-Blackwell, 2007. ↑ Emerson E, Baines S. Health inequalities & people with learning disabilities in the UK: 2010: Department of health, 2010. ↑ Tyrer F, McGrother C. Cause-specific mortality and death certificate reporting in adults with moderate to profound intellectual disability. Journal of Intellectual Disability Research. 2009,53(11):898–904. ↑ Chadwick DD, Jolliffe J. A pilot investigation into the efficacy of a signing training strategy for staff working with adults with intellectual disabilities. British Journal of Learning Disabilities. 2009 Mar;37(1):34–42. ↑ Veselinova C. Supporting individuals with learning disabilities. Nursing and Residential Care. 2012,(11):566–9. ↑ Chadwick DD, Jolliffe J. A pilot investigation into the efficacy of a signing training strategy for staff working with adults with intellectual disabilities. British Journal of Learning Disabilities. 2009 Mar,(1):34–42. ↑ Higgs J, Smith M, Webb G. Contexts of physiotherapy practice. Sydney: Churchill Livingstone Elsevier, 2008. ↑ McBean D, Van Wijck F. Applied neurosciences for the allied health professions. McBean D, Van Wijck F, editors. Edinburgh: Churchill Livingstone Elsevier, 2014. ↑ Jackson C, Cavenagh P, Clibbens J. Communication and self-esteem in adults with down syndrome. International Journal of Language & Communication Disorders. 2014 Mar,49(3):275–87. ↑ Kingston K, Bailey C. Assessing the pain of people with a learning disability. British Journal of Nursing. 2009,18(7):420–3. ↑ Lewer A, Harding C. Communication is the key: Improving outcomes for people with learning disabilities. Tizard Learning Disability Review. 2013,18(3):132–40. ↑ Veselinova C. Supporting individuals with learning disabilities. Nursing and Residential Care. 2012,14(11):566–9. ↑ Beacroft M, Dodd K. ‘I feel pain’- audit of communication skills and understanding of pain and health needs with people with learning disabilities. British Journal of Learning Disabilities. 2011,39(2):139–47. ↑ Godsell M, Scarborough K. Improving communication for people with learning disabilities. Nursing Standard. 2006,20(30):58–65. ↑ Chadwick DD, Jolliffe J. A pilot investigation into the efficacy of a signing training strategy for staff working with adults with intellectual disabilities. British Journal of Learning Disabilities. 2009,37(1):34–42. ↑ The Scottish Government. Principles of inclusive communication: An information and self-assessment tool for public authorities. Edinburgh, 2011.